It seems to be quite on-trend these days, at least here in Singapore, to have dedicated art exhibitions catering specially to the toddler to tween set. The month-long June school holidays are upon us and Singapore’s two main modern and contemporary art museums, the Singapore Art Museum (SAM) and the National Gallery Singapore (NGS) have each launched their respective kid-centric blockbuster shows – Imaginarium: To the Ends of the Earth at SAM, and the Gallery Children’s Biennale: Dreams and Stories, NGS’ inaugural biennale for children. If you’ve read one of our previous posts, on Raising a Museum Kid, you will already know that we at (plu)ral are completely in favour of bringing children to see and experience art, not to mention the fact that, despite our advanced age, we remain somewhat overgrown kids ourselves. So we were excited to check out these shows and certainly did not consider it beneath our dignity to fully immerse ourselves in the experience, as is evident from the pics of P and U exploring Hiromi Tango’s installation, Lizard Tail, at SAM, below! Here, then, is a brief rundown of what the two shows have to offer – and some thoughts about dedicated children’s art exhibitions, the manner and form that such exhibitions should take and if they are, indeed, the best way to introduce young audiences to art. But first up, the seventh edition of SAM’s annual family-focused exhibition, Imaginarium which, this year, is entitled To the Ends of the Earth. Through the works of nine contemporary artists, the show invites visitors to take a closer look at the surroundings and environments we reside in and to reflect on the earth’s myriad marvels and wonders. If the general opinion, as a comment to one of our recent Facebook posts seems to suggest, is that exhibitions for children ought to strive to be as immersive and interactive as possible, then the works in the show offer plenty of opportunities for young and not-so-young visitors to see, touch, feel and engage with the artworks. Wanderland, an installation by Singapore artist Mary Bernadette Lee is a case in point – an immersive and interactive work that evokes a “forest” of hanging and floating flora and fauna that visitors can crawl through, peer into and tug on, it certainly captivated and engaged the young visitors that we saw. For the slightly older child (and what school-age child these days isn’t completely hooked on electronic gadgetry?) UuDam Tran Nguyen‘s robotic drawing machine will fascinate as it allows the visitor to operate, with a simple touchpad, a vehicle that drags marker pens across a sprawling canvas, creating a sketch on the floor. Here’s a short video of U trying her hand at it. A work which we were particularly struck by was Thai artist Nipan Oranniwesna‘s mixed-media floor installation, Another Island, comprising 598 images of Singapore’s natural and urban environment, encased in tiny epoxy bubbles embedded on the floor. Hidden speakers add to the immersive experience by emitting sounds and voices recorded by the artist on a visit to Singapore. While Imaginarium aims to take the visitor “to the ends of the earth” and even beyond, to magical imaginary worlds, this work invites us to stop for a moment and enjoy the hidden treasures that can be found right here at our doorstep. When one has lived in a place for some time, it is easy for our surroundings to become so familiar that we no longer pay close attention to them. Nipan’s evocative work is a reminder to be more fully present as we go about our daily lives and to appreciate the little things that make a place special. The NGS’ inaugural Children’s Biennale opened with a bang last weekend, some two weeks after Imaginarium was launched, with opening festivities that included special performances and plenty of free drinks and snacks, drawing a sizeable crowd of families. The nine installations are spread out across several floors of the gallery, so do pick up a Biennale guide at the ticketing counter to help you navigate the exhibition and find everything. 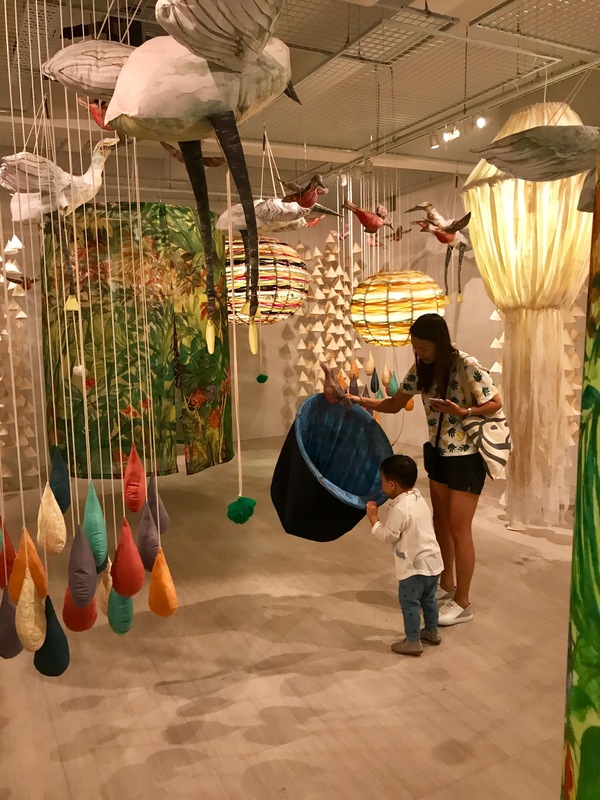 As with Imaginarium, the curators of the Children’s Biennale have largely adhered to the truism that an exhibition for children should be interactive and invite participation and play. Just off the ticketing counter, in Basement 1 itself, are three installations that adhere to this guiding principle. In the interactive installation, Homogenizing and Transforming World, the Japanese interdisciplinary collective teamLab has filled a room with glowing orbs that bob and float around, changing colour and producing sounds when touched, triggering changes in other surrounding orbs and creating a pathway of colour. Visitors, both young and old, delighted in being enveloped by the balls of light and sound, which, as you can imagine, also made great backdrops for Instagram-worthy selfies and wefies! Long lines also formed as parents and children waited to take their turn walking on the vertiginous 12-metre-long glass bridge that is Mark Justiniani‘s Firewalk: A Bridge of Embers. Using mirrors and reflective surfaces, the artist toys with our perception of space, depth and perspective. Looking down, the visitor gets a view of what appears to be an archaeological site, stretching far beneath his feet into infinity – an imagined excavation into the foundations of the former Supreme Court Building where the NGS is now housed. The work has a surreal, dreamlike quality, giving the visitor the unsettling feeling of being suspended in a space-time continuum. Global artistic phenomenon Yayoi Kusama draws huge crowds whenever and wherever her works are exhibited and this iteration of her well-known installation for children, The Obliteration Room was no exception (click on the link for the Tate Modern’s time-lapse video and description of the work.) Beginning with an all-white room in which the floors, ceiling, walls and every item in it is painted a uniform white, visitors are invited to add colourful dot stickers anywhere they like, ultimately eliminating all traces of the original white room, in an act of communal “obliteration” of the space. So – should you take your kids to these shows during the school holidays or any time after? Absolutely! I am firmly in the take-your-kids-to-see-art-any-chance-you-get camp. And I have no doubt that they will be engaged, entertained and thoroughly delighted by the efforts made by both museums to include works that are bright, colourful, tactile and that make sounds, move, light up and are, to put it in one word, fun. I must confess, however, to a niggling sense of disquiet and to wondering whether any child visiting these exhibitions would be able tell that they were in an art museum, looking at art, as opposed to playing in an amusement park or playground. Is the context and the meaning of the artworks lost in all the busy-ness and activity, the bombardment of the senses that these artworks seem to embody? But then again … does that even matter? Surely the primary goal is to draw children and families into our art museums and to engage them – a goal that I agree has been amply met by both shows. Indeed, this preoccupation with art as spectacle is hardly one that arises only in relation to children’s art exhibitions. Roberta Smith, co-chief art critic of the New York Times has said, in a 2011 piece entitled “Substance and Spectacle”, “Artworks seem only to get bigger and shinier, and spectacle – participatory or not – is becoming the new normal at museum exhibitions of contemporary art.” The playground reference certainly comes to mind with Carsten Höller’s tubular slide, which Smith cites in her article. (An aside to our fashionista friends – he built a version for Prada’s Milan head office and that’s Miuccia Prada walking in the background in the pic below!) Other works of his at the same exhibition included a mirrored carousel and a swimming pool. You can read a review and discussion of the works in the show here. By all means, let your children run riot in the Obliteration Room pasting stickers everywhere, but perhaps I might venture to suggest that you also take the time and find a quiet moment or two to talk about the works a little, explaining that they are works of art and getting your child to consider what the artist was trying to communicate through a particular work, at a level that is appropriate to his or her age . You will be surprised by what even a pre-schooler can come up with if you bother to ask! The museums have also arranged various programmes for parents and children, in conjunction with these exhibitions (information is available on their respective websites) and they are a really useful way to get more out of the shows. Finally, don’t let this be the one time in the year that you and your children visit an art museum. There is every reason to go, and go often, even when there isn’t an ambitious blockbuster kids’ exhibition on, with all its bells and whistles. Find creative ways to expose your children to the visual arts and expand their awareness of and interest in great art, even (or especially) those that they can only look at, without touching. Both the NGS and the SAM have resources, materials and activities available throughout the year, catering to younger audiences. We were also very pleasantly surprised to find so many new books for children at the NGS’ museum shop, Gallery & Co, especially ones that focused on works in the museum’s own collection. So, while children’s art exhibitions can be exciting, stimulating and great fun, I hope you and your children will also find pleasure in art throughout the year. Happy holidays!